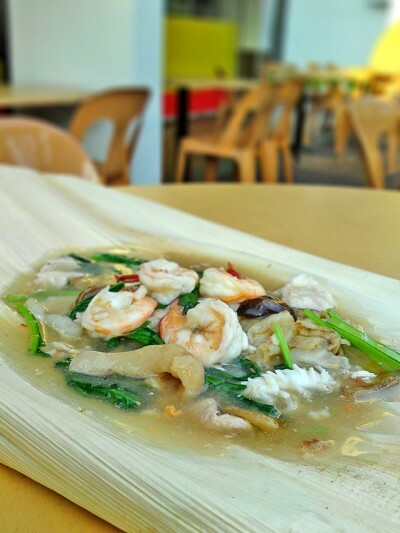 Fei Lao Seafood may sound new to you but it is a household name at Bedok area for hor fun with a ferocious ‘breath of the wok’ or what is famously known as the wok hei in cantonese. Somehow it’s here where the spirit of the fire can be unlocked to impart that nice smoky sublime flavour from the wok to the hor fun which lingers over the opeh leaf. Well, for those who are interested to read more on Fei Lao, I’ve written 2 posts on it and it’s here and here. The wok hei is only one of the areas where Fei Lao stands head and shoulders above the rest. The other is the gravy which had that translucent look where the skillfully seared hor fun submerged in. 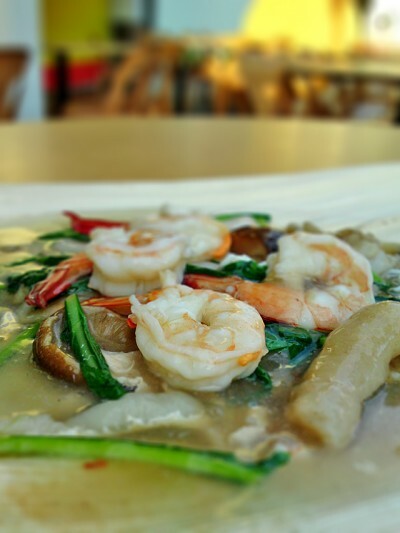 Premium seafood like big sea prawns and sea cucumbers are this opeh leaf hor fun’s trademark while other miscellaneous ingredients like pork, liver, squid, fish, big mushrooms and choi sum ensure that it is a $10 well spent. Not to wax too much sentimental here, but a Fei Lao’s pack is highly regarded for it’s richness in the robust wok hei flavour and when the time comes for the chef to sear the hor fun, you can witness the most amazing smoky kitchen of your life. Well well, I’m half-suspecting that the hor funs are being barbecued instead of being fried! I’ve eaten from Fei Lao since a long long time ago when they were still at Changi Lorong 108 and if truth be told, never once had I experienced a bad aftertaste after eating it so it is possible that very little MSG are used to enhance the flavour. The distinctive fragrance and taste is so unique that no where else in Singapore can you part $10 to get something as good. After eating from 7 stalls, I have no doubt that here is a clear winner. If death is the only thing that’s certain in life, then this is one food you must eat before you die. Conclusion: This were sold at $10 in those days when a tin of oil was $15. Today a tin of oil can cost anything between $30 to $40 and it is still selling at $10. 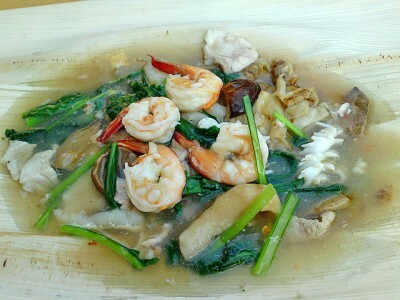 Undoubtedly still the best opeh leaf hor fun for me in the $10 bracket. It is one thing to see the picture( plus drooling) but another to eat it. You must make time for it, to witness for yourself how it can energize your umami harmoniously. Likes: Robust wok hei flavour. Delicious gravy. Good ingredients. Dislikes: On a bad day, you might get one that has a wok hei overdrive. Can be good or bad thing, depending on your taste bud. Thanks! 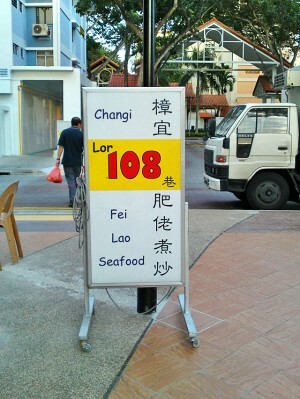 I have been hoping to find this Fei Lo 108 hor fun place again after they moved from Joo Chiat! Had lunch there yesterday, shiok, the $10 plate was just nice for the wife & me…but then my wife is a small eater:)! I think the wok hei at Fei Lo is better than those at Teck Hin at Ghim Mo & Ah Wok at ION. Glad you found them. They’re still the best hor fun for me. Even my Malaysian friends claimed it’s better than their own in Malaysia! Great site to find good “hor fun”. Thks. In 1960s at junction of Geylang Rd / Lorong 40, there was a stall named “ma lai kai”(malay chicken)in a coffee shop famous for its “hor fun”. Many patrons came in posh cars to “da pao” the food. The chef retired in 1970s. His daughter-in-law took over and fried good “hor fun” too. I last ate there in 1988/89. The owner of coffee shop changed, the stall shifted out and could not be found. Do any one know the where about of “ma lai kai” stall? Great to see that people still remember the “Ma Lai Kai” Hor Fun of Geylang! I grew up with this stall’s Hor Fun but unfortunately I think the stall has closed as far as I know. I’m hoping it might still be open somewhere. Fei Lo, the owner of Fei Lo Seafood, was a friend of my mum’s and even he remembered Ma Lai Kai and said that Ma Lai Kai was the best in the business and that he emulated Ma Lai Kai’s Ipoh style in that the Hor Fun is fried but never charred, thus its pristine white appearance. Sadly, Fei Lo, has passed on and looking from the pics above, his disciples are more than a shade below what he used to be.